When it’s freezing outside in NE Ohio, I love making comfort food like a good pot pie. But since we rarely eat meat I needed a new flare on the veggie pot pie. Brush the underside of the dough with egg wash for this pot pie recipe creates an airtight seal so that steam will push the pastry lids into a dramatic dome during baking. Whisk flour and salt in a large bowl. Work in butter with your fingers until only pea-size pieces remain. Combine egg, vinegar, and ⅓ cup ice water in a small bowl and drizzle over flour mixture; quickly work in with your fingers until a shaggy dough forms. Turn out dough onto a work surface and press together, working just enough to form a smooth ball with no dry spots. Wrap in plastic and chill until very cold, at least 2 hours. Do Ahead: Dough can be made 2-3 days ahead. Keep chilled. Heat oil and 2 Tbsp. butter in a medium saucepan over medium. Cook onion, stirring occasionally, until very soft, 10–12 minutes. Add tomato paste and cook, stirring often, until color darkens and paste completely coats onion, about 1 minute. Add button mushrooms and cook, stirring occasionally, until softened and any liquid has evaporated, 12–15 minutes. Add sherry and cook until almost completely evaporated, about 5 minutes. Add broth and porcini mushrooms. Bring to a simmer and cook until reduced by half (about 2½ cups), about 1 hour. Strain mushroom broth through a fine-mesh sieve into a medium bowl, pressing down on solids; discard solids. Heat remaining 3 Tbsp. butter in a large saucepan over medium. Whisk in flour and cook, whisking often, until flour begins to smell nutty, about 4 minutes. Whisking vigorously to prevent lumps, add mushroom broth and increase heat to medium-high. Bring to a simmer and cook 1 minute. Remove from heat. Do Ahead: Gravy can be made 2-3 days ahead. Let cool; cover and chill. Place a rack in middle of oven; preheat to 425°. Combine fennel, onions, 1 Tbsp. butter, and 1 cup water in a small saucepan; season with kosher salt and pepper. Bring to a boil over medium-high, cover, and reduce heat. Simmer until fennel and onions are crisp-tender, 5–8 minutes. Uncover; cook until liquid evaporates, 15–18 minutes. Let cool. Heat remaining 2 Tbsp. butter in a large skillet over medium. Cook thyme sprigs and mushrooms, tossing occasionally, until mushrooms are browned and tender, 6–8 minutes. Let cool; pluck out thyme. Divide fennel mixture and mushrooms among ramekins. Spoon gravy over top. Divide dough in half. Working with one at a time, roll out to ¼” thick. Cut out 2 rounds about ½” wider than the diameter of ramekins. Gather up scraps, reroll, and cut out 2 more rounds (for 8 total). Whisk egg, a pinch of kosher salt, and 1 tsp. water in a small bowl. Brush dough with egg wash; place over ramekins, brushed side down. Press firmly around sides to adhere. Brush tops of dough with egg wash; sprinkle with thyme leaves and sea salt. 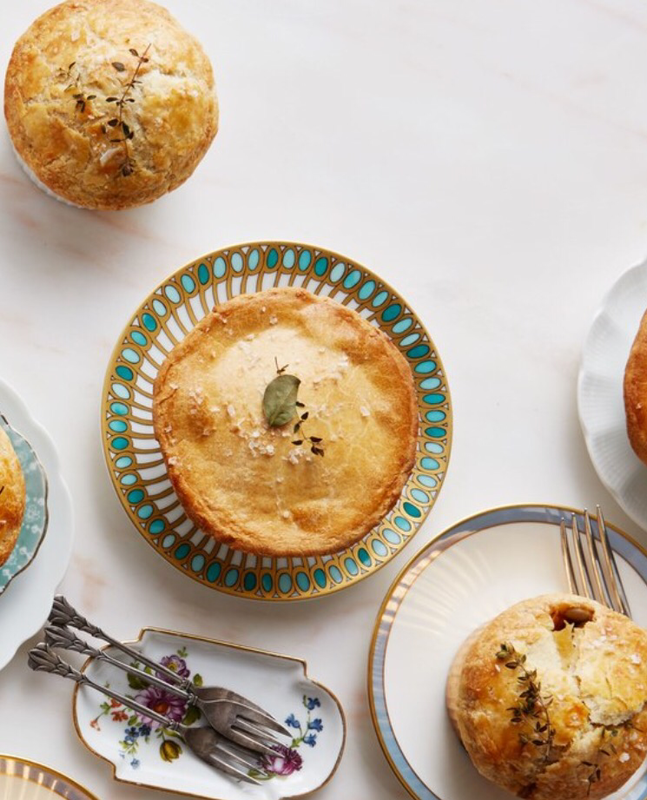 Set pot pies on a rimmed baking sheet and bake until crusts are golden brown and domed, 25–35 minutes. Have you made these Deb? They look & sound delicious, i can’t wait to try! I make all recipes on here yes. Yes I make all the recipes you see here.